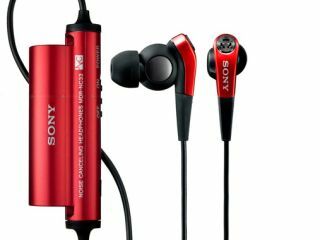 Sony today launched the world's first in-ear headphones that use digital noise-cancelling technology to "eliminate" ambient noise. The MDR-NC300D and MDR-NC33 use AINC (Advanced Artificial Intelligent Noise Cancelling) technology to continuously monitor and analyse surrounding noise levels and select the correct anti-noise level whether you're flying, on the bus or working in the office. Sony claims that the combination of sound isolating and noise-cancelling technologies gives a 98.4 per cent reduction in ambient noise. I SAID A 98.4 PER CENT REDUCTION IN AMBIENT NOISE. The MDR-NC300D headphones use Sony's S-Master Digital Amplifer technology that promises "a commanding, detail-packed" listening experience with all genres of music. Listeners can select from three different sound modes (Movie, Bass, Normal) that fine-tune frequency responses, and sound quality also benefits from a large (16mm) neodymium driver. The vertical in-ear shape is designed to give maximum comfort for even the longest listening sessions, and the NC300's come with seven different sizes of soft silicone earbud to a good fit. Conveniently, you can switch off the digital noise cancelling at the flick of a switch if you want to hear what's going on around them. Sony says a single AA battery will give up to 20 hours of uninterrupted listening. The NC33 are less powerful (and presumably cheaper) than the NC300D's, blocking out around 90 per cent of ambient noise. Both headphones weigh about 8g (not including the battery compartment), come with an in-flight adaptor and cord adjuster. Prices are TBC but expect them in shops in October.